It seems that the Optare Solo has not been a big hit with Citybus, or it may just be a case that there is a greater need elsewhere. At least 212 has already been noted in Poole as Damory Coaches 3713. 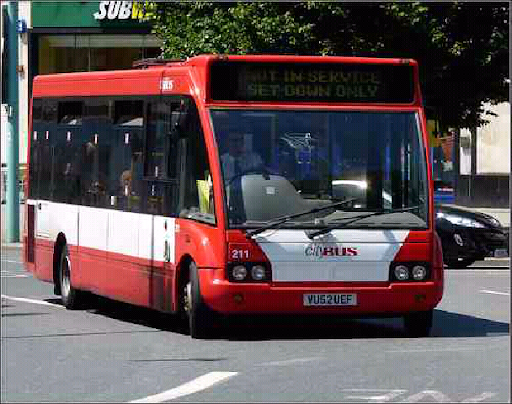 211 &213 had been reported as being out of service while 210 has been on training duties in August with Citybus. That would explain the Step Darts coming back into service on the 13 then. I'd expect that they keep at least one at Milehouse for regular running on the 31. Graham all of the Solos are off to GSC. 3 steps kept for 13, 59 and a dedicated school bus. From September 17th one step Dart only for school and 13. All Plymouth stage carriage network should then be low floor bar some school buses. That should read commercial Plymouth stage carriage network. For some reason the Solos were not popular in the North East and that is why Go North East got rid of them, the last ones ironically to PCB. 210 was out on Service 20 earlier today. Also saw an Enviro 200 on the 13 yesterday. Musical buses this week them!! In livery news, spied a double decker in Perry's livery yesterday too, i guess this is advert replacement for 127 which was carrying this livery and is now out of service. 152 has been getting alot of variety, in the form of 33, 144 & Citaros. Suprised a Step Dart wasn't kept behind for this service? On Tuesday 213 was on the 23/24; I had a quick ride on one of them. The interior is fairly tacky and is definitely nowhere near the level of quality of a Dart MPD. However, it actually pulled quite well! I expected it to be a very loud, thrashed and underpowered engine, however it did have some 'go' in it. It also had a slight whistle when changing gear; I'm not sure if it has an Allison gearbox or not. I also spotted another Solo on Tuesday on the 43A!